French poet Arthur Rimbaud was born in 1854 in the Ardennes and went on to influence many writers and singers of the 20th century including Dylan Thomas, Nabokov and even Bob Dylan. Reputed to have little moral sense and a deep restlessness, he began writing poems at a very early age but stopped suddenly when he was just 21 years old. His father was an infantry captain and was away from home on postings more often than not. Rimbaud’s mother, from a solid Ardennes family, lived mostly separate from her husband. He was not even present at the births of his sons and eventually even failed to come home on leave leading to a more permanent separation. In 1862, the family moved to Cours d’Orleans and the mother guided her children strongly towards what she saw as all important academic success. Rimbaud, however, didn’t much take to his school work at first and resented his mother for pushing him so hard. While most of his reading had been from the Bible, when he and his brother moved to Le Collège de Charleville he came into contact with a much wider range of literature. His education seemed to surge forward suddenly and he won a number of prizes for his scholarly achievements. Georges Izambard greatly influenced Rimbaud’s desire to write, acting as his mentor and during that time he wrote the poem Ophélie that later became considered one of his most famous works. The Franco Prussian War broke out in 1870 and the school was thereafter used as a military hospital. 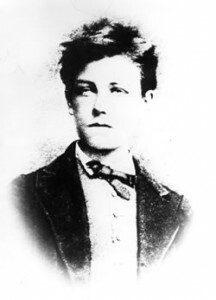 Restless, Rimbaud ran away to Paris but was arrested for vagrancy on his arrival. After a letter was written to Izambard, Rimbaud was released into his care, returned home to his mother but then ran away again shortly after. After a period when he drank large amounts of alcohol and was rude to just about everyone, Rimbaud fell under the wing of symbolist poet Paul Verlaine back in Paris. Taking absinthe and hashish, they led a tempestuous hectic lifestyle and began a relationship although Verlaine was married. The out of control Rimbaud caused scandal where ever he went and was considered the ‘enfant terrible’ of the time, though he was, at the same time, producing a wide body of visionary and striking verse. Verlaine left his wife and child and he and Rimbaud moved for a while to London where their relationship began to disintegrate. Verlaine eventually returned to Paris. They reunited in Brussels but Verlaine flew into a rage and tried to shoot Rimbaud, injuring him in the wrist, for which he was sentenced to two years in prison. Rimbaud returned to Charleville and completed his symbolist work A Season in Hell. In 1874 his other most well-known work Illuminations was finished which consisted of 42 poems he had written whilst with Verlaine in London. In 1875 Verlaine came out of prison and met, for the last time, with Rimbaud who had already given up writing poetry for steadier work. After going to the Dutch East Indies, Rimbaud returned to France but his desire to travel and wander had not left him. He went to Cyprus and then to Abyssinia where he stayed between 1880 and 1891, settling in Aden and working in the coffee trade. In 1891 Rimbaud, at the age of 37 developed cancer and died after a terrible illness that lasted a long few months. He was buried in his home town of Charleville.